Bishop of Helsinki, Evangelical Lutheran Church of Finland (ELCF) from 1 September 2010. Irja Askola was born 1952, in the small Finnish town Lappeenranta next to the Russian border. She started her theological studies at the University of Helsinki 1971 and continued them as an academic research assistant until 1981. She has studied also in Germany, USA and Tanzania. From 1991 until 1999 she worked in Geneva as an executive secretary for Conference of European Churches. She is an active writer and has published for example six poem books. 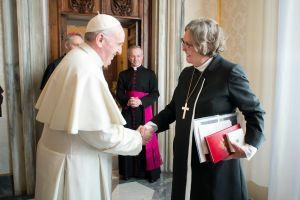 Irja Askola was elected a bishop for Helsinki diocese 2010 being the first female bishop in Finland.